Figs. 1-12. Pterocorys zancleus, with forma hertwigii in figs. 3, 4. Note relatively large size, pronounced wings and wide abdomen in figs. 1 and 2, thoracic and abdominal ribs in figs. 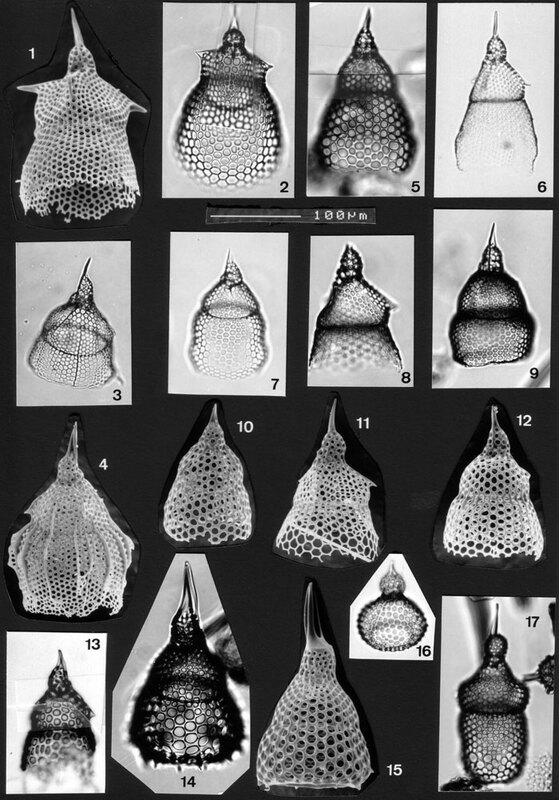 3 and 4, and variance in pore shape (cp. figs. 10 and 11). BSS; 28B(II); 21B(F) EF Y22; BSS 5OB(F) EF C31; BSS 28B(II), 31B(FI) EF K29; 28B(II); 27B(F) EF R41; 13B(F); 25B(F) EF J29; 38B(F) EF N39 and 2x 28B(II). Figs. 14, 15. Lamprocyclas aegles forma maritalis. BSS 30B(F) EF H38 and BSS 28B(IT). Figs. 16, 17. Theocorythium trachelium. Fig. 16: oblique view of incomplete specimen. Note pore-size change at distal end. Fig. 17: more complete specimen with well-developed abdomen, IOW 188(F);BSS 27B(F) EF Z40.